Tioniaga supplies some types of convenience food categories machinery from Haas Steinhoff such as Waffle and Ice Cream Cone. 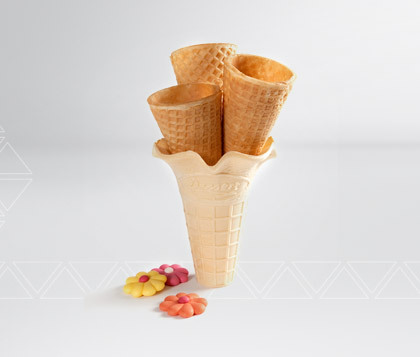 If rolled ice cream cones or molded ice cream cones and cups, if for industrial filling or for your local ice cream parlor – ice cream in a wafer cone is a year-round treat that is popular throughout the world. For the industrial production of Belgian waffles two different types of specially developed automatic baking ovens are used. The oven type depends on the product (batter waffles or hard dough waffles) and on the desired capacity. One possibility is that batter or dough is applied at the oven head onto the lower plates of heated baking plate pairs. Then, the baking plates are closed and travel through the oven. After one turn, the baking plates open again at the oven head. 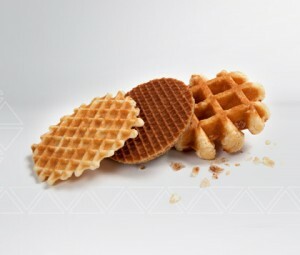 A drum takes off the waffles by vacuum or with needles (depends on type of product) and transfers the products to a conveyor, which passes them to cooling or further process steps. A second possibility is that the waffles are baked between two separately mounted, but synchronized baking plates. At the oven head, the plates unite to baking plate pairs, and at the oven end, where the products are discharged, the plates separate again. A special device, compressed air or a scraper release the products and pass them to a wire-mesh band which transfers them to a cooling zone and possible further process steps.